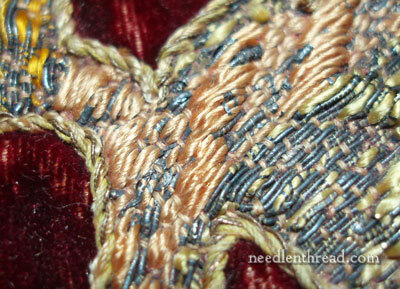 Remember that piece of old goldwork on velvet we were looking at several weeks ago? There’s much more to look at and to learn from the piece! Today, I’ll show you some stuff on the front and talk a little bit about what the back shows us, too. First, let’s look at some bumps. 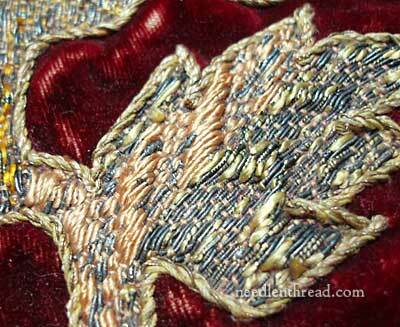 There are several areas on the goldwork panel (which you can see in full in this article) that are raised. Remember that all the metal threads on this piece are couched – there’s no chip work or anything like that. So, to create a sense of texture and variety in the piece, there are three approaches that were evidently taken: 1. To use different couching techniques to create patterns; 2. to use a variety of couched metal threads; and 3. to raise certain areas into bumps. 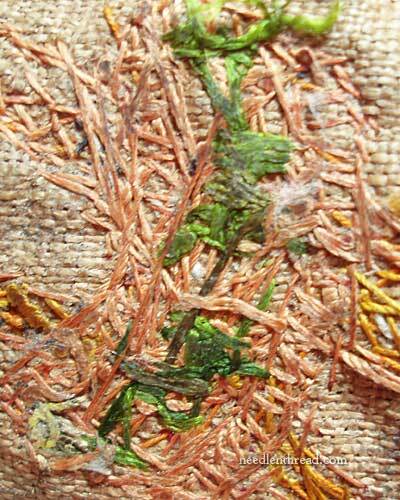 In the photo above, you can see two raised areas on this embroidered element – one on each side of the center. The areas are padded first with a bundle of string and then the metal passing thread is couched back and forth over the string, with the couching stitches placed only at the very sides of the bump. You can see where the string bundle has been exposed (green arrows). Surprisingly, there are very few areas on the whole piece where the background behind the metal threads or silk is exposed. This is the only spot where the string makes a noteworthy appearance. If you look at the back of this element, it can show us a lot about the order of work here. Even though it looks like a muddled jumble, we can see that the couching over the string bumps happened first, because all the other threads in this element, at some point, cross over the smaller parallel stitches that run down the shape of the raised bumps. 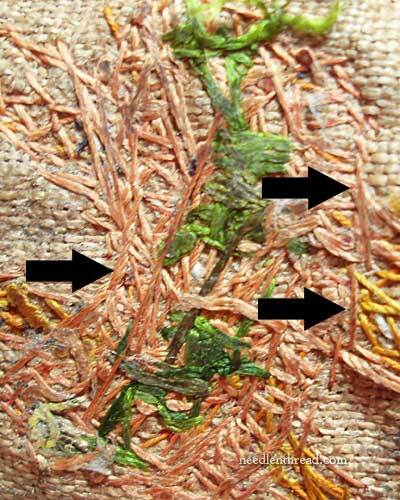 Then we can see the, on the center filling section, the metal threads went down first and were couched with the couching thread, and then the green silk (which looks a bit ratty on the front, but is quite vivid on the back), was stitched over those. Finally, we see some stitches in the same couching thread – long, somewhat slashing stitches – all around the shape, defining it, and these are the couching stitches on the silk and metal cord that outlines every element on the whole piece. So, the raised bumps, in this case, were stitched first, and that makes sense, because they define the shape and the size of the element. They got those in, and then everything else around them was either filling or outlining. Other areas where you can see defined bumps in the goldwork include various leaves, where these zig-zag waves across the leaves give some texture to the leaf. Though not as heavily padded with stitching as the bumps above, there are wider, flatter, smaller bumps here. And to define the bumps, the metal threads are couched on the very edge of the bump, but not as they pass over the bumps. Up close, you can see more easily that the metal threads span the bumps without interference with couching stitches, creating smooth, visible bumps in a pattern, and thereby adding interest and texture to what otherwise could have just been an over-abundance of straight, flat couching. 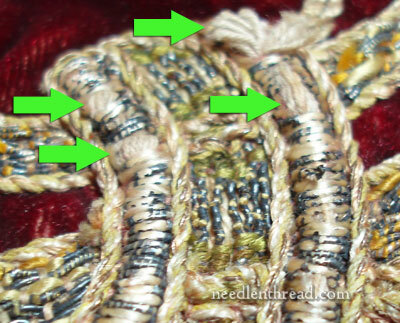 Keep in mind that, in the photo above, the metal threads have worn away from the silk core of the threads. In the original, this would have gleamed solid gold, and the light would have reflected on those raised bumps differently than it would have on the flat couched areas. Ahhh – lovely, lovely! Another area with a small bump. The threads here are in very good shape. Instead of a core of silk wrapped with a single wire (like the metal thread in the element we just looked at above this one), here we have a twist of multiple gold wire threads. 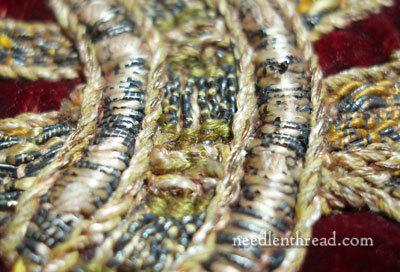 You can clearly see where the bump is and where the couching stitches stop on each side of the bump. So, next time you want to work an elaborate piece of embroidery entirely in couching, vary your couched threads, your methods of couching (throw in a little silk here and there! ), and raise things up a bit with some padding in patterns. The results will be lovely, and some hundreds of years later, people will be dissecting your work, to see just how you did it! very enlightening. Good idea about raising different parts for effect (contouring) without necessarily accenting that fact with different threads/outline/etc. I like it!! The more we get to see of this piece, the older I feel it is. Thank you for showing us the backside. That brilliant green and yellow is a revelation all on its own, and makes me think this piece really is from the 16th or 17th century, as does the slightly varied thickness of the threads themselves – looks hand spun rather than 19th or 20th century machine spun. The use of core string and the variety of couching techniques to create so many effects also shows the creativity of a master needleworker, who either came from a tradition that still had a limited stitch vocabulary, or simply chose to ‘keep it simple’ while making it look more complicated. Thank you for the inspiration. Oh, you think so? This is a case of ‘speak for yourself’ I reckon. Your work is so far in front of mine it’s very lonely. This is a wonderful thread and I am enjoying it immensely. It would seem that there isn’t much if any of this sort of thing available for sale in this country, or certainly not in places I go, so for me what you are doing here is doubly useful and interesting. Where would a person go to find such things? Really? What a curious thought. I must throw some wildcard stuff in from now on and give them something to base a whole thesis on! Is there any chance you will replicate some of these elements in new materials? Just to show the former glory of the entire piece? Hi, Kyra – I’m definitely thinking along those lines! 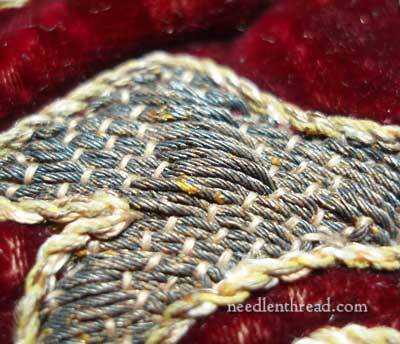 Padded work with string, then goldwork then silk….any idea why the couched goldwork was done before the silkwork? There’s the everlasting problem of the silk catching on the gold. Or would the fact that the netal threads couched down make the difference? Next Next post: I Don’t Stitch with This!